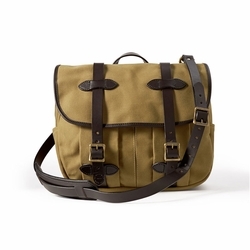 Filson Field Bag - Medium. This water-repellent, multi-purpose field bag has rain-diverting gutter flaps and a buckle-closure storm flap for added weather protection. A reinforced base handles heavy loads, and a removable Bridle Leather shoulder strap offers carrying comfort.